In their press release, the HBF say: “Ipsos MORI has recently undertaken a full independent review of the Customer Satisfaction Survey and its processes. The report concludes that the survey approach and processes are consistent with best practice, that it is ‘fit for purpose’ and is a robust measure of customer satisfaction in the new homes industry. The industry will now be reviewing the recommendations made.” Hardly unsurprising given that Ipsos MORI has “acted as a consultant” as far back as 2006! Is this a cynical attempt to head off any likelihood of a truly fully-independent new home customer survey being required as recommended in the APPG Inquiry Report? 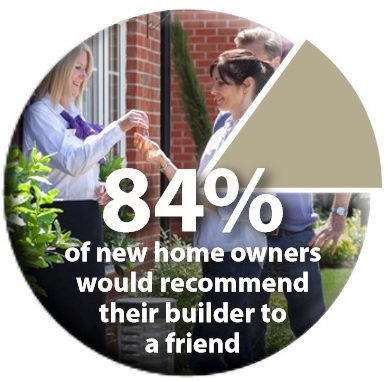 “Housebuilders should make the annual customer satisfaction survey more independent to boost customer confidence. 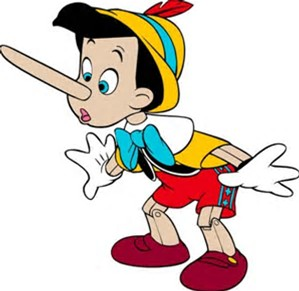 At the APPG Inquiry, the NHBC confirmed that the results of their 9-month customer satisfaction survey were typically 5 to 10% lower than the 8-week survey. No wonder these results are never made public! So much again for transparency Mr Baseley! So here it is at last, Britain’s only new home customer satisfaction survey, conducted by the industry for the industry. The sole purpose of the HBF survey being to “rebut negative claims on build quality”. But the facts speak for themselves, even in a survey conducted by the industry and quite probably manipulated by housebuilders. During the survey year to 30 September 2016, the NHBC registered as complete around 140,000 new homes, of which about 80% (112,000) being privately sold and potentially eligible to be part of the HBF customer satisfaction survey. As in previous years, only new homes with an NHBC warranty (around 80% of new homes) will almost definitely (81%) receive a survey, provided that these homes are not rented by buy-to-let private landlords. Out of an approximate potential 112,000 privately sold new homes, the NHBC sent out 90,501 surveys on behalf of the HBF with 52,290 returned, a response rate of 57.7%. 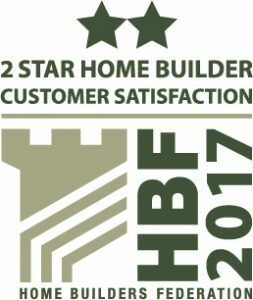 The HBF Survey Star Rating “sample” size totals 39,014 out of the total 52,290 surveys returned! This indicates that 13,276 (25.4%) of the surveys returned were not used for housebuilder star rating! I asked the HBF why? The overall ‘satisfaction’ score is 84%, down again for the 4th year running and at its lowest level for nine years! A record number of new home buyers, 98% (up from 93% last year) that returned the HBF survey, reported problems to the housebuilder (within the first 8-12 weeks) with over four in ten (41%) reporting more than 10 problems – a 3% rise on last year. It is questionable how much influence housebuilders are exerting on recently moved in buyers to complete the HBF survey to show them in a more favourable light, despite a great many having incomplete homes, serious defects and overall poor quality homes. 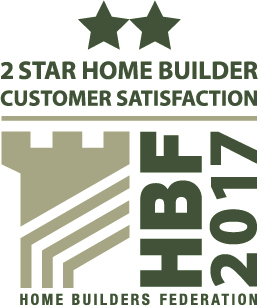 From free patio slabs, to £250 John Lewis vouchers and offers to “help” complete the HBF survey – it’s all being done to manipulate a better star rating, against HBF rules but with HBF knowledge. “The overwhelming majority of new home buyers are happy with their new home” say the HBF “Housebuilders remain committed to delivering the high quality product, and responding appropriately when issues arise” So why do they repeatedly fail to do either so often? Both Taylor Wimpey and Persimmon said they were addressing it over 12 months ago, yet their satisfaction scores are lower. 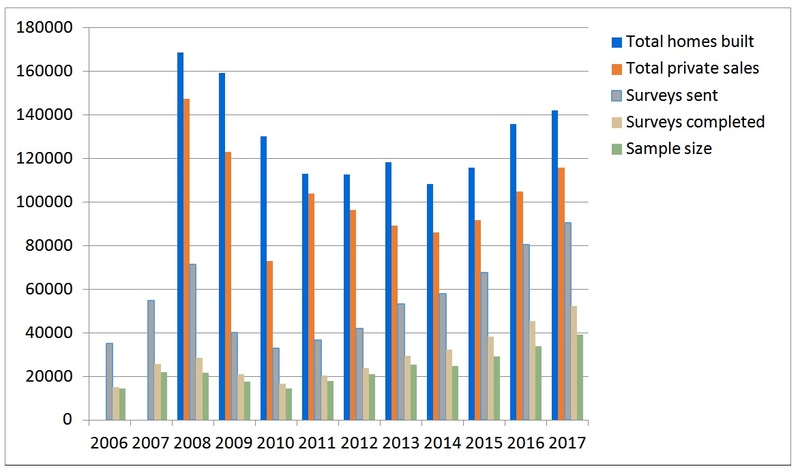 “Since the survey was launched more than a decade ago scores in all question areas have improved significantly” Not true the number of buyers reporting problems was 93% then, it’s 98% now! In addition the 2006 HBF survey was from a very low base with 57% of builders rated 3 stars or less and a sample size of just 15,000 surveys returned. “The past 3 years have seen a slight fall back in scores, something the industry is actively addressing.” I think you’ll find that was the last four years! Whatever the industry is allegedly doing, it isn’t having any positive or apparent measurable success. Even Secretary of State Sajid Javid said earlier this week: “It’s fair to say that new builds don’t always have the best reputation for quality…..this isn’t a new issue” So why isn’t the government doing anything about it? 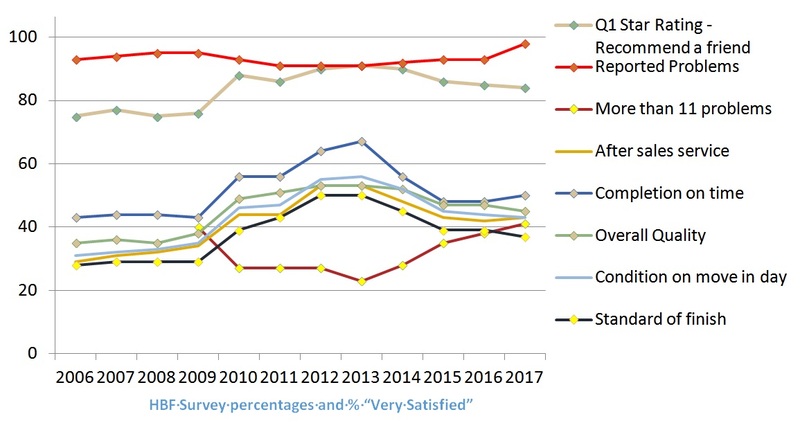 Even the industry’s own Customer Satisfaction HBF Survey latest results show it’s bad, it’s getting worse and still nothing is being done about it! The survey is supposed to be anonymous but buyers need to add their housebuilder, address and postcode. The website is owned by MD Insurance who run both LABC warranty and Premier Guarantee! They also administer the Consumer Code for Home Builders. This survey cannot be regarded as independent! The survey published thus far, is I believe, little more than an opportunity for self-justification of yet another industry survey and with just 1,000 surveyed, these results can be regarded as pretty meaningless. So under the “New Home Review” even a dodgy two star house builder will be able to display a “Gold” customer satisfaction rating logo, confusing and deceiving consumers. This entry was posted in New Homes and tagged builder star rating, customer care, HBF, quality. Bookmark the permalink.